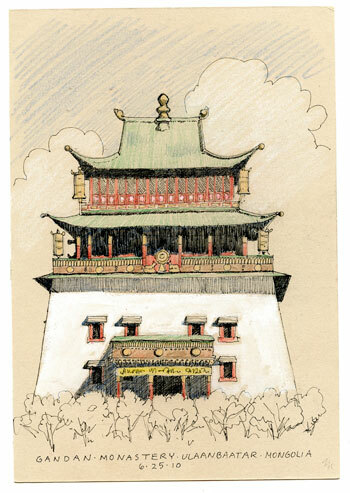 I’ve planned this next trip to leave time for more sketching and to do studies using watercolor pencils and gouache. Last year it was all I could do to keep up my Flag Expedition Journal. This time I’ll be writing my journal in a Moleskin sketch book, but it won’t be a big narrative production like before. The current plan is to spend the first two weeks traveling in the countryside camping out with a guide/driver and a cook. This will provide maximum flexibility since one can camp pretty much anywhere it seems reasonable to put up a tent. It’s one of the great things about Mongolia and something I haven’t been able to take advantage of before. Then I’ll be in and out of UB for a couple of weeks, then going to Ikh Nartiin Chuluu Nature Reserve for about ten days. I’ve been easel painting almost exclusively for most of the year and haven’t done much field sketching, so I felt I needed to spend some time getting back up to speed. 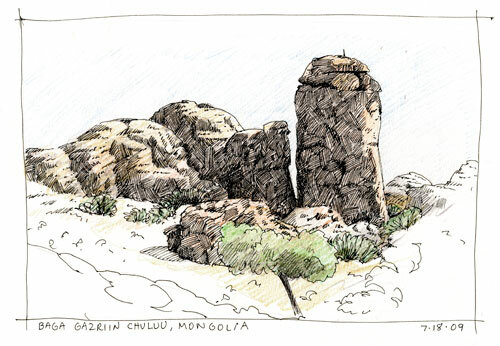 I got a start late last week and spent the afternoon doing the kind of work I plan to do in Mongolia when I can sit for awhile drawing something that isn’t moving much, like buildings or rocks. 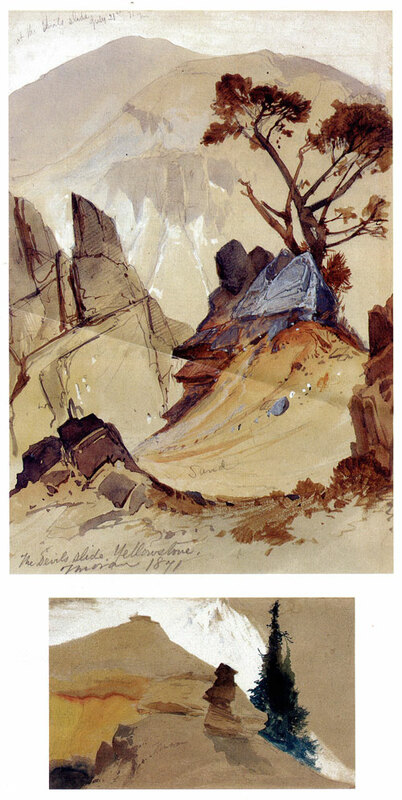 Some years ago, my husband and I saw a show of field studies Thomas Moran did when he was the artist accompanying the Hayden Expedition, which surveyed Yellowstone, resulting in the creation of Yellowstone National Park. He worked on toned paper with watercolor, using an opaque white for his body color. I really loved the look he got and started to experiment with different papers. What I’ve settled on is a 100% cotton paper, Annigoni, from Cartiera Magnani, an Italian company that dates back to 1404. I’ll be using another Magnani paper, Pescia, when I want to work on a white surface. Both take water media quite nicely. 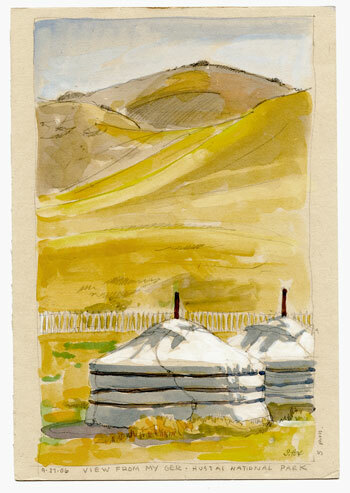 Pan gouache on Annigoni paper, 10x7"
Main Temple, Gandan Monastery- Sakura pen, watercolor pencils and body color, Annigoni paper, 10x7"
Enroute from Ulaanbaatar to Arburd Sands ger camp- pan gouache, Annigoni paper, 10x7"
Horse and tack studies- Sakura pen, watercolor pencils, Annigoni paper, 7x10"
Rock formations, Baga Gazriin Chuluu Nature Reserve- Sakura pen, watercolor pencils, Pescia paper, 7x11"
Thanks, David! 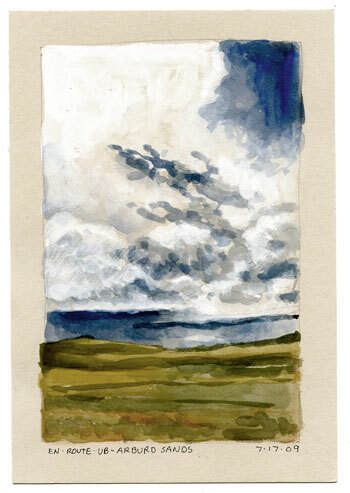 Watching you do location watercolors at SKB some years ago was also an inspiration to me. It made me realize that, especially for international travel, watermedia is a lot more practical to take along than oils, as much as I love them. I’d love to study with you sometime. Yes, Nancy Foureman has told me about The Wilds, particularly that they have takhi, the Mongolian wild horse. Unfortunately, captive takhi, in many cases, can have significant morphological differences from the ones that have either been born in the wild or come from semi-reserves, where they are able to live a more “normal” life. From the one photo on the website, theirs look pretty good, though. I think they have been involved in the Species Survival Plan for the takhi for quite some time. Sad to say, I won’t be at SKB this year. Between six weeks in Mongolia and going to San Diego ten days after I get back, I think I’ll be traveled out for a little bit. Maybe you should come to Redwood Country sometime :0). Thanks for the great post! 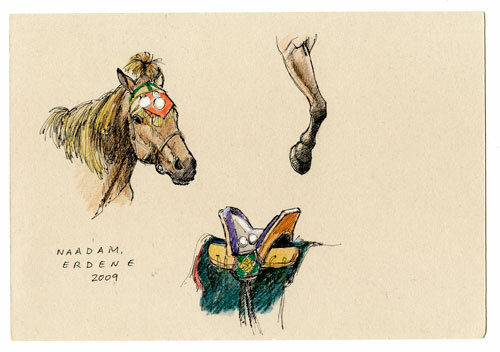 I love seeing your process with the transition back to field sketching. Very smart and logical. I can’t wait to see the results from your trip. Thanks again.